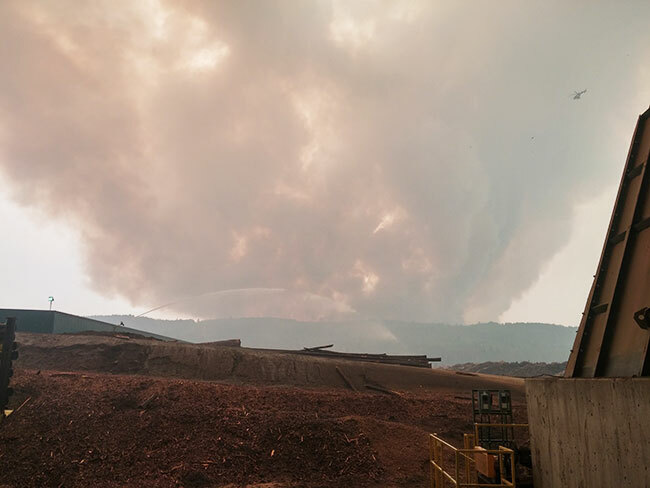 Feb. 26, 2018 - The story of Northland Forest Product’s fight against The Beast – the fire that ravaged Fort McMurray in May 2016, destroying close to 2,500 buildings – is almost hard to believe. 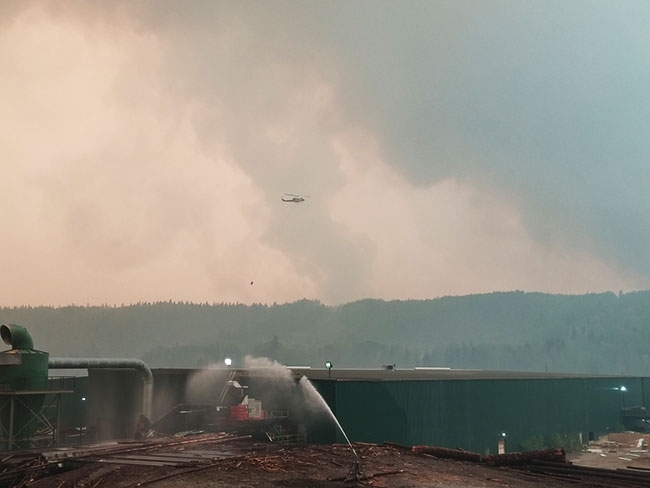 On May 3, as Fort McMurray emptied under the mandatory evacuation order, about 30 people took refuge at the Northland Forest Products sawmill site 18 kilometres north of the city on the shores of the Athabasca River. Those who stayed were not inactive. In the first week staff with the help of government cleared out the trees that surrounded the mill and set up lawn sprinklers and later water cannons. They placed a sprinkler on the roof of the planer, and others to surround the main office building. Water cannons were placed on the roof of the sawmill and in the log yard. “The one night the fire ran on the west side of the hill [across the highway from the mill] – it looked like sunset at 2 p.m. When it came up to the ridge it was 300 feet of flame,” Howie says. With the sprinklers running they stood their ground. It was a strategic move. Howie was in direct contact with provincial forest service district manager Bernie Schmitte, who had accurate and up-to-date wildfire information. Northland set up sprinklers and water cannons at the mill site and log yard to prevent ember transfer. The crew remained at Northland during the entire evacuation of Fort McMurray. The mill was at times a refuge for a handful of wildland firefighters who preferred to stay there over bunking in town. About two weeks in a contractor came by and hooked up a temporary sprinkler and hydrant system fed by the Athabasca River. “That gave us a lot of confidence. At that point with our cannons and sprinklers and the added sprinklers, we were putting roughly 70,000 gallons of water into the air. If the fire was close we would start it up and leave it to run to prevent ember transfer fires,” Howie says. The entire ordeal lasted just over a month and in spite of a few threatening days, the fire never reached the mill. David Harman, director of business development and forestry for Northland, says it was a group effort that saved the mill. “There are some really good people in different jurisdictions who are in the fire service. That’s good to know,” he says. Looking back, Howie is proud of their efforts during the fire, but knows the situation could have been a lot worse. The need for preparation is a message he wants to share with other forest communities.